Texas Camel Corps was established to educate the public about the historic use of camels in America in the 19th century. The forms this education takes on are camel treks, historic reenactments and programs at schools, libraries, museums, and historical sites. Other business endeavors include featuring our camels as part of faith-based or cultural events as well as TV/Film production. At the heart of it all, though, is education. Whether it’s the perpetuation of the unique role camels played in settling Western America, utilizing the camels as a classroom for environmental/social studies or trekking over the very ground explored during the US Army Camel Experiment of the 1850’s, the driving goal of Texas Camel Corps is to share our camels in one of a kind settings that the public will enjoy and remember. Since 1997 Texas Camel Corps has been educating on the unique part camels played in opening up America’s West. Owner Doug Baum had stumbled across this little-known piece of history while a zookeeper doing research on the animals in his care. Though these beasts of burden have served man for over 4,000 years, Baum realized there was a lack of awareness of camels and desert ecology as well as the historic US Army Camel Experiment of the 19th century. Thus was born the education arm of Texas Camel Corps. In addition to education programs, in 1998 Baum leased his camels and services to the feature film “A Texas Funeral” starring Martin Sheen. The movie focuses on a family that, among other eccentricities, finds itself the owners of the US government’s herd of camels. 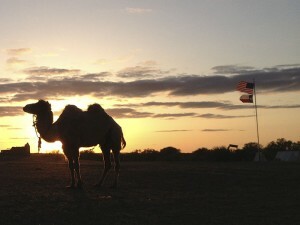 In 2002, Texas Camel Corps provided camels for the film production “Nadezdha”. Texas Camel Corps is listed with the Texas Film Commission. Christmas time is busy for Texas Camel Corps as well. Between Thanksgiving and Christmas Eve, the Baum family’s camels travel the state, setting the scene for the biblical journey the Magi took to visit Bethlehem. Productions across Texas rely on Texas Camel Corps to add an “extra touch” to turn their dramas into truly memorable experiences for their audiences. From 1997 to 2009, Texas Camel Corps created curriculum for VisionQuest, a national placement agency for at-risk youth. For ten days each month, Baum instruced a dozen youth in camel handling and took them on 3-day CamelQuests. The benefits derived from the program were intensely personal to Baum, given his love of children and education. Previous CamelQuests took place in Arizona’s Coronado National Forest and Sonoran Desert, as well as the Big Bend region of Texas. In 1999, Texas Camel Corps began offering Camel Treks to the public in the Big Bend region of Texas, over the very same areas traversed by the US Army Camel Experiment of the 1850’s and 60’s. Available spring and fall, the multi-day treks focus on desert ecology, the natural history of the Chihuahuan Desert and the colorful past in which the camels took part. Current offerings include the Big Bend region of Texas and tours of Egypt and the Sinai desert where guests live in the homes of locals. Texas Camel Corps has been featured in Southern Living magazine, Texas Monthly, Texas Highways, AAA’s Texas Journey Magazine, and Texas Parks and Wildlife Magazine as well as True West Magazine, US Airways Magazine, the New York Daily News, the New York Times, the Dallas Morning News, the Fort Worth Star-Telegram, the Houston Chronicle and the San Antonio Express-News. National Geographic Explorer TV program included Texas Camel Corps in a segment on Canada’s Odyssey Exploration Society, three Canadian adventurers who crossed the Arabian Desert after receiving camel-handling training from Texas Camel Corps. Creating new, innovative ways to share these marvelous animals with people is what drives Texas Camel Corps. Please explore the entire website and feel free to contact us.